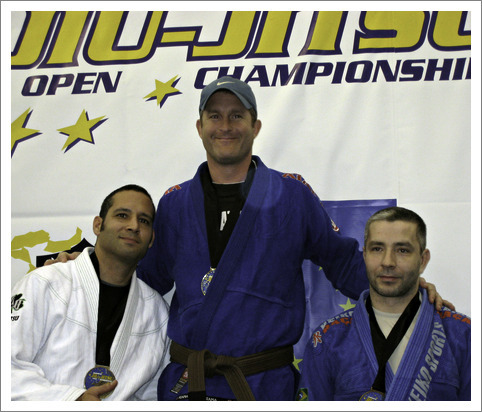 This article reflects on my experience as a first-time teacher of Brazilian Jiu-Jitsu. My friend Babak Alimoradian of Team Extreme recently had this cool video commissioned to promote our Brazilian Jiu Jitsu program. Check it out! Draculino Team from Barray Audiovisuals on Vimeo. Below is an article from this morning’s Marbella Express newspaper about the Draculino Team’s performance at the recently 2011 European Brazilian Jiu Jitsu Championship. Sunday, January 30, I competed for the first time as a black belt in the 2011 European Brazilian Jiu Jitsu Championship, in Lisbon, Portugal. My category was light weight (under 76kg), Senior 2 division. The good news is that I received third place (bronze medal), as you can see from the podium picture above. The bad news is that I got beaten by both those other guys. Adimilson Brites (nickname ‘Juquinha’), from Gracie Humaitá Brazil won gold, and François Deniau (Team Megaton Lyon, France) won silver. On Saturday, January 30, 2010, I traveled to Lisbon, Portugal to compete with my team-mates at Gracie-Barra Marbella in the brown-belt, lightweight, Senior 2 category of the European Brazilian Jiu-Jitsu championship. Despite an unfortunate previous evening (having eaten something obviously bad), I managed to win my category — making this the third time I’ve won gold in this competition. Man, I’ve been on some kind of good luck streak lately! First the brown belt a few weeks ago, and now, this past weekend, I competed and won the gold medal in the Brown Belt, Senior 1 division of the European Brazilian Jiu-Jitsu Championships. Woo-Hoo! Just kidding, folks! 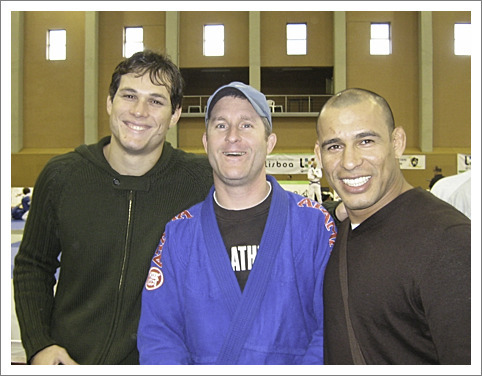 As any self-respecting BJJ aficionado will quickly note, that man on the left happens to be none other than the very best BJJ and grappling practitioner walking on the planet today — current world champion, Roger “The Man” Gracie! December 14, 2007 was a really big day for me, as I was awarded the brown belt by my brazilian jiu-jitsu teacher, Edson Jorge (of Gracie-Barra). There’s only five belts in BJJ — white, blue, purple, brown and black — so I’m only one step away from the BIG ONE. By no means do I feel like a brown belt (especially since I seem to sometimes still forget some of the very basics), so it’s going to take some getting used to I guess! In theory the brown belt represents the bridge between purple and black, where the student needs to focus on leading and teaching, so those’ll be my objectives this coming year. On the same day I got mine, my long-time training buddy Mike Rios also got his brown belt. So all in all, it was a very special day! Yahoo! On Monday night, at Brazilian Jiu-Jitsu training just after returning from the European championships, instructor Edson Jorge awarded me the purple belt! After almost five years of training in this sport, it sure feels good. This, however, is both good, and bad. A lot of responsibility goes with the purple belt. It’s the first belt in BJJ that generally qualifies you to teach. And it’s the half-way point to black. That’s the good. The bad, for me, is that the student are really gunning for you when rolling in class. I’d kind of decided to modify my training, to try to reduce the number of little niggling injuries that seem to have accumulated, by rolling hard only once a week. But now it seems like I’m going to be fighting for my life every time we train. In January of 2006, I won gold medal in the Blue Belt Senior 1 division at the European Brazilian Jiu Jitsu Championship! As a first WordPress website, I’ve reworked and relaunched the website of our local Brazilian Jiu-Jitsu / Grappling martial arts club — Gracie Barra BH Marbella (a.k.a. Marbella Submission Fighters). So far, I’m really happy with WordPress. Since, apart from my Mom, only about two other people read this blog, I won’t consider myself too pretentious in announcing that last night I was awarded the first degree of my Brazilian Jiu-Jitsu Blue Belt, by Gracie-Barra black belt instructor Alexandre Albuquerque, here in Marbella, Spain. That means, two more degrees and it’ll be time for a Purple Belt. Brazilian Jiu-Jitsu was made famous in the mid/late 1990’s when Royce Gracie dominated the Ultimate Fighting Championship (UFC) as an expert in this relatively unknown martial art. He was beating — not just beating, dominating — people much bigger than himself, and without hitting or kicking. He systematically took his opponent to the ground, and proceeded to choke or arm/leg-lock his opponents into surrendering. In the years that followed, BJJ and grappling martial arts have so thoroughly dominated all No-Holds-Barred (NHB) fighting competitions, that practically every combative martial art has today incorporated ground techniques, tending towards a common discipline known as “Mixed Martial Arts.” Even having trained in BJJ for nearly four years now, it never ceases to amaze me how easy it is, through the application of just a small set of fundamental positions and moves, to utterly dominate new students who are much bigger, faster and stronger than myself. For those with a bit of knowledge in martial arts, Brazilian Jiu-Jitsu would appear to be a fusion of Judo and wrestling. Whereas in Judo and wrestling, the objective is to pin your opponent, in BJJ, the objective is to force your opponent to “submit” (give up, via tapping the ground or you). You achieve this generally via arm or leg locks, joint locks, or chokes. In BJJ sport competition, you also can win by gaining points for things such as improving your position. For those living on the Costa del Sol (Spain) — especially in the Marbella, Puerto Banus and/or San Pedro areas — and interested in Brazilian Jiu-Jitsu, Submission Wrestling, Vale Tudo and Mixed Martial Arts, we are proud to announce the opening of Marbella Submission Fighters. Opening Thursday, July 1, at the Apolo Gym in San Pedro de Alcantara, we’ll be training Tuesday, Thursday and Friday nights from 21:00 (9:00 pm) to 22:15 (10:15 pm). If you’re interested, drop me a line via email or in the comments below. PS: (Shameless Business Plug) Like that poster design? We’ve got some excellent design staff in our company, who, depending on our internal load, can be made available for your design project. Drop me an email if you’re interested.